Is There a New Bundle of Joy in Your Family? 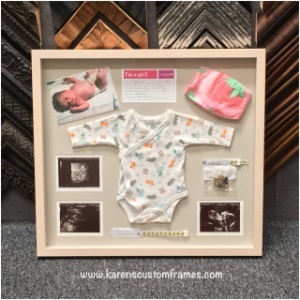 A unique, custom designed shadowbox display frame created especially for you and your family, is a wonderful way to preserve your baby’s precious first moments and keepsakes for a lifetime! 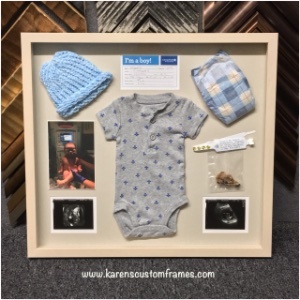 After our customers had their second child, they wanted to preserve their baby boy’s mementos in a memory box. They were so happy with the finished design, mom gathered up her first born daughter’s baby memories to create a second unique shadowbox display frame for her baby memory box.